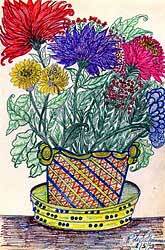 Rose deSmith Greenman was born in Boston in November 1898 but didn't begin creating art until 1969. From 1970-1977, while struggling with Alzheimer's disease, she produced a staggering number of drawings. Working with pencils, pen, and crayons, deSmith Greenman interpreted her world with intricately detailed drawings of her house, garden, and family. The view of gardens during her poetic realism phase combine minutely detailed flowers with highly stylized cubism in vivid shades of color. Her landscapes of maple trees, oak trees, and vines add to the child-like magic of her compositions. In 1977 she abruptly stopped creating art, leaving behind a legacy of nearly two thousand drawings. Sixteen years after deSmith Greenman's death in 1983, her daughter and son-in-law, Betty and Frank Avruch, rediscovered her work in their attic. Her work has been shown at the Outsider Art Fair in New York City. She is currently represented by the Berenberg Gallery of Boston, and KS Art in New York City. Select the gallery links and click on the thumbnail image to view the picture. Click on each panel number to scroll through the thumbnails.